It’s A Very Busy Week For Zines In Montréal! Just a quick reminder to all my local readers – this weekend is going to be so hectic and so wonderful! First thing in the morning, I’ll be hopping onto my bike with an overflowing backpack and basket full of zines and tabling at Expozine (5035 Saint-Dominique, 12-6pm on Saturday and Sunday). Come say hello and check out all the new zines I’ve got in stock! Later in the evening, there’s a zine reading and show at La Époque in Verdun. Tabling again on Sunday, and then off to see Jeff Miller and Aaron Cometbus at Drawn & Quarterly. 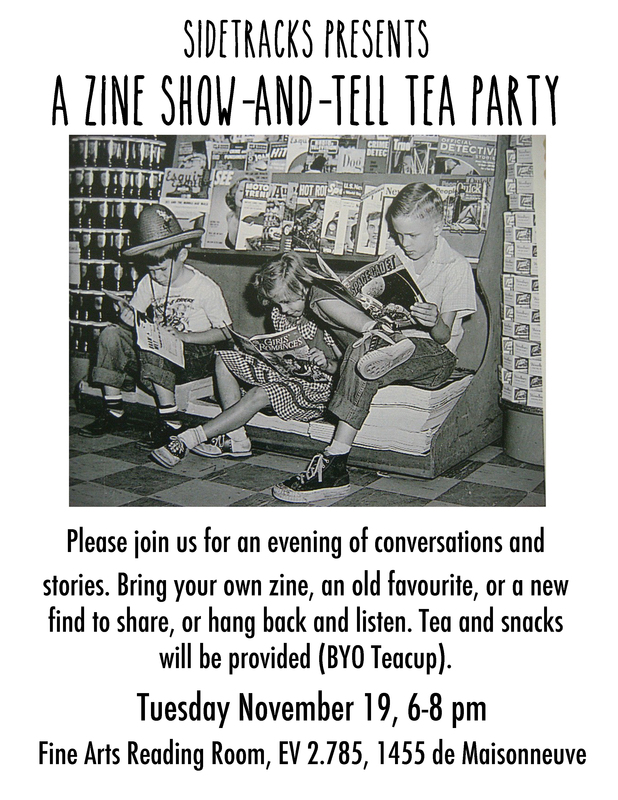 AND THEN on Tuesday afternoon, I’ll be reading at A Zine Show & Tell Tea Party, hosted by the Sidetracks Screenprinting Team (with whom I’ve been volunteering for three years). See you there!